The Medical Research Council’s Laboratory of Molecular Biology is one of the highest profile research communities in the world, with work of LMB scientists being awarded 11 Nobel Prizes, shared between 15 LMB scientists. 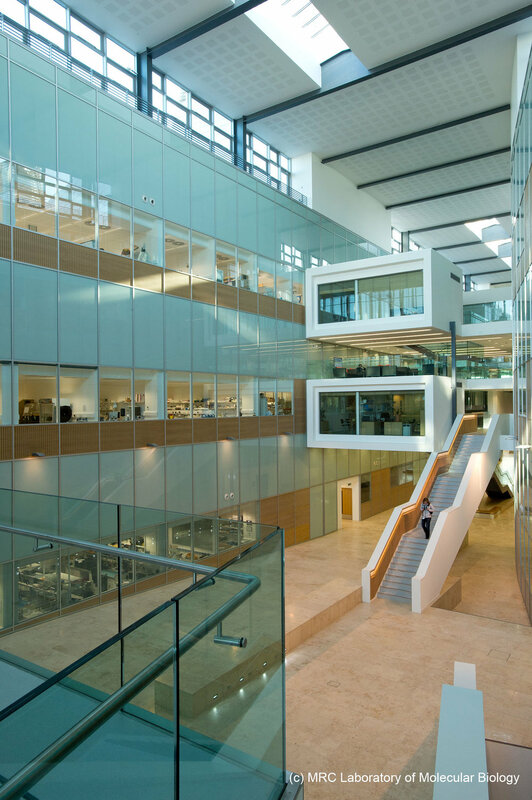 Colin Moses led the design team for its new building, at the Cambridge Biomedical Campus, adopting a plan which promotes interaction between the different research groups and also – appropriately enough – reflects the form of the X chromosome. Each of the primary groups has its own identifiable base with dedicated office spaces, meeting and seminar rooms, but these are linked by an active central atrium space and facilities shared by all the building’s users. 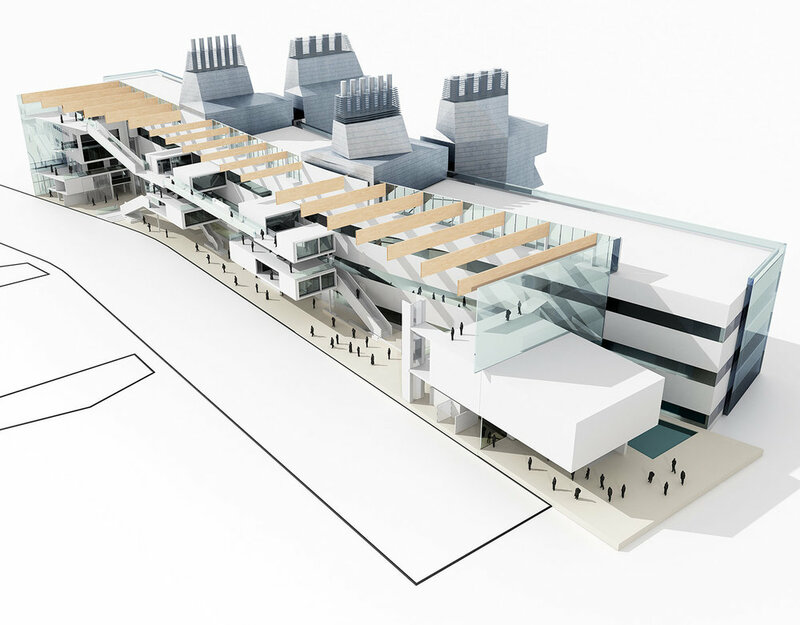 Despite being wrapped in a triple-glazed envelope that acts as a thermal flue, there is considerable transparency both within the building and in terms of the views out – all of which support the idea of the LMB as a community of scientists. Write-up spaces and bench areas are placed around the perimeter, and there are many windows onto the internal atrium as well as the airy walkways which span it at four points on each level. 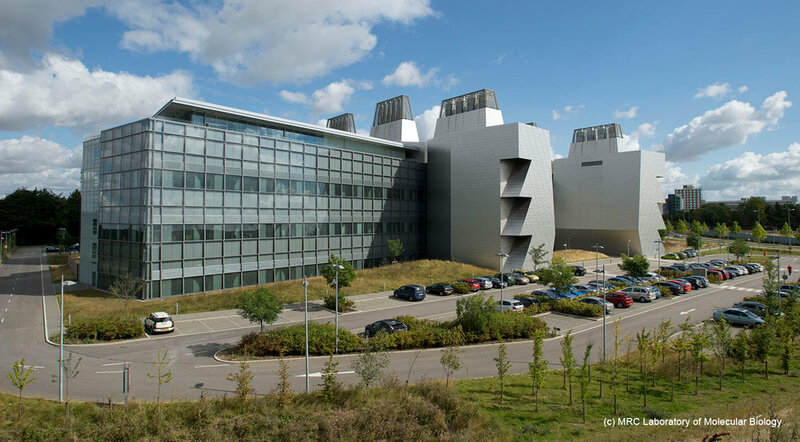 A rooftop café had been at the heart of this scientific community’s previous building, so another high-level café was created in the new laboratory to ensure that this important aspect of the LMB’s culture was not lost in the move. The design challenges the usual form for this type of laboratory by minimising the extent of the rooftop plant enclosures. The primary air handling plant is located in four free-standing, stainless steel clad, sculptural plant towers. Ductwork routed laterally, directly into interstitial service voids (ISV’s) between the occupied research levels. This configuration improves the capacity for long term flexibility within the research spaces as well as minimising any vibration issues by isolating the plant structure from accommodation structure. The plant towers are potent visual markers within the edge of city setting, giving a strong and distinctive identity to the facility. The plan form promotes strong, easy and flexible interaction between the research groups within the building whilst maintaining an identifiable area for the primary research groups with dedicated office spaces, meeting and seminar room facilities. Write up spaces and bench areas have great external awareness through the triple glazed, compact thermal-flue external skin.